Once again, despite my wholehearted intentions and efforts, another Wednesday evening had arrived and, instead of meditating with my root sangha (Buddhist meditation community), I was at home. Feeling exhausted, out of sync, and in deep need of restoring myself in a place of uninterrupted quiet where I could relax my busy mind with the steady flow of my breath and invite the precious moment-to-moment, non-judgmental awareness that defines mindfulness. So I was unduly pissed at myself for not being organized (or awake) enough to get there, my mate for not making it easier for me, and all those unforeseeable or unavoidable forces that arose in the course of a day and became “obstacles” to my practice. Adding to my irritation: knowing that I now lived a few minutes away from the temple yet was faced with detours and delays that made getting there seem like a trip to the other side of the state. What the hell?! At the same time, I was completely aware of the absurdity of my frustration. How could I be stressed out about needing to meditate…so that I could be less stressed? 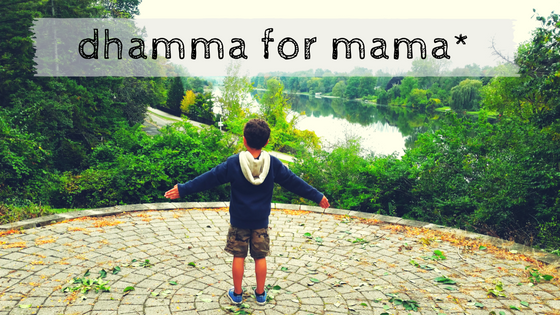 My life was completely different: Mothering my then-infant son, finding a rhythm with my mate in our new life together as parents, and maintaining some sense of order in our new home were my highest priorities. And, around these, I sought to balance my teaching commitments, time with loved ones, and the space to nurture myself through my practice. Doing all of this mindfully was my deepest aspiration. Which is precisely why I wanted to connect with my sangha—to enjoy walking and sitting meditation in the sacred space of the temple; to share our curiosities, contemplations, and challenges; and, in turn, to be supported in the practice of cultivating mindfulness! Cycling through this loop of grasping-anxiety-frustration, I realized that in my striving to get to the temple, I was working myself out of alignment with the heart of the practice! There was, as the Zen wisdom beautifully teaches, “nowhere to go, nothing to do” but to rest mindfully in the present moment wherever I stood, sat, or lay. INHALE. Being aware of frustration and unskillful, negative chatter. EXHALE. Allowing it to be expressed and felt. INHALE. Giving it space to soften and settle. Stopping to breathe, listen deeply, and see clearly into my discomfort with some of the changes I was adjusting to helped me accept that my new life could no longer accommodate a two-hour evening meditation. I cherished that time with my fellow practitioners at the temple, but it was no longer an option. No cushion, no mala, no bell, no incense were required. In the absence of all these, I needed only to take refuge in the here-and-now quality of the breath—my constant teacher—in order to cultivate that steady, quiet space where mindfulness blossoms. Bringing that gentle, expansive awareness to each moment I spent cradling my son, preparing dinner for my family, or talking to my mate was, in fact, the practice. It was how I could live the meditation. Although the teachings of mindfulness are rooted in the traditions of Buddhism (my path to this practice), its universal principles transcend the temple or meditation hall. It is a commitment to self-study that teaches us to develop nonjudgmental awareness of our bodies, thoughts, emotions, experiences and all that arises in our lives. We learn to quiet our “inner critic” and suspend our knee-jerk reactions and give space for qualities such as compassion, equanimity, and non-attachment to grow. Indeed, we learn to nurture mindfulness by practicing meditation. We learn to sustain it through our diligent efforts off the meditation cushions and benches. So parenting has truly been a re-education in mindfulness for me. All that I thought I understood and experienced in my five years of practice prior to my son’s arrival has been stretched in directions I hadn’t fully imagined! I renew my commitment to non-attachment on a daily basis when I’m not able to “accomplish” tasks as intended. Sometimes I can easily shrug it off and relax in the present moment, knowing it will keep. At other times, I have to acknowledge and release the irritation or anxiety of feeling thwarted. These challenging moments become opportunities to deepen my understanding and to practice wholeheartedly this living, breathing meditation. And then I exhale, remembering that there is nowhere to go, nothing to do, nothing to attain. So whenever it is that a task gets completed or whenever I safely reach a destination, it will be at the right and perfect time. Truly! And there are so many moments with Kiran that I see my younger self and/or youthful inclinations reflected in him, and so I try to respond and nurture him in ways that would have been most helpful and supportive to my developing self had those tools been known and applied.